Hindu Calendar 2019 with Tithi in pdf for free download is in English and Hindi and is based on Calendars followed in North India – Jammu and Kashmir, Haryana, Punjab, Himachal Pradesh, Delhi, Uttaranchal, Rajasthan, Madhya Pradesh, Uttar Pradesh, Chhattisgarh, Bihar and Jharkhand. A month in this Hindu calendar begins after Purnima and ends on Purnima. 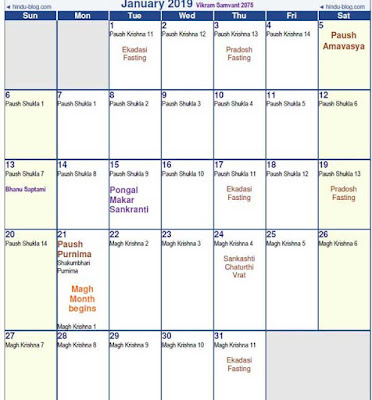 All important festivals and fasting 2019 dates are marked in the calendar. Link - Download Hindu Calendar 2019 with Tithi in Hindi in pdf (हिंदी) - contains important festivals and vrat. The font is in Hindi. The calendar is based on Purnimat system. A traditional Hindu month begins after Purnima or full moon day.